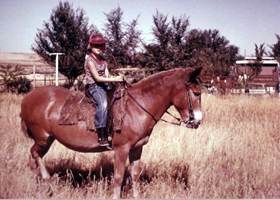 History of DarkHorse Ranch, Inc. Through the years, many horses marked the journey of coming to know the responsibility, knowledge and skill required in caring for and managing horses to maintain their optimum health and well-being. And, sadly, to find that outside the dreams of childhood, all horses are not well-loved, well cared for, or treated with humanity. Too many horses live lives of desperate hardship and pain. In recognition and appreciation for all that the horse has given to those of us privileged to share his companionship and loyalty, DarkHorse Ranch chose to be a place where horses, no matter their condition or their history, could come for their second chance at a decent life. And a rescued horse, depending on his injuries and/or deteriorated physical condition, is a "crash course" in equine care and management. They are the teachers, and each leaves his own special mark upon one's life. Rescue and rehabilitation of the horse is a bittersweet mixture of the intense satisfaction and pride that comes with restoring a damaged horse to health and usefulness, and a profound sorrow when one fails despite using every resource and every bit of knowledge and skill at one's disposal. From one's successes comes the strength to endure the last goodbyes. And those goodbyes leave an indelible mark upon the soul of a horselover. Jenny was the best mule in the whole world. A friend bought her cheap at the auction along with a big old buckskin ranch horse named Smokey. Smokey turned out to be a runaway, which I found out at the age of five. But Jenny would go anywhere and do anything we asked, including horseshows and parades. And during hunting season, she packed the game out of the mountains for my Dad. As kids, we never realized how special she truly was. 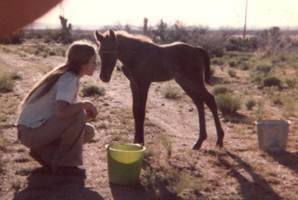 This is Apache, my one and only beloved "first horse". I saved up $15 toward her purchase, and my Dad made good on the balance. I was nine years old, and so was she. I thought she was the most beautiful horse in the whole world, and she was the center of my life as a child. She was also cagey, stubborn and had a limited tolerance for childhood antics. I have realized in the years since that although she often made the decisions about where we would go, and at what speed we would be going... she was my teacher, and she kept me safe from harm. More than anything, she was my unconditional friend. I had her for twenty-five years, and I would love to have her back again for just one more day. This is Aneurin, my "surprise" colt. 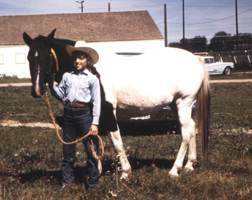 He was an exotic mixture of the blue-roan Quarter Horse mare, Sina... and accidentally sired by a golden palomino stallion who was an Andalusian/Tennessee Walking Horse cross. "Aneurin", is Welsh for "the golden one", and was given that name when he was born a dark chocolate brown with blue eyes. As he matured, his color was entirely golden, including his eyes. When he was born, I feared that Sina, in her efforts to protect him from humans because of what had happened to her, would teach him her wildness and mistrust. Fortunately, I was able to befriend him, and he remained kind and trusting. The year was 1980, and this was my daughter's first ride. Twenty years later, she's still riding! This is my soulmate, El Despejo. I bought him when he was just coming two years old, and he was almost completely wild. He is the kindest horse I have ever known. At the same time, he is hotblooded, sensitive and skittish. And superbly athletic, quick and supple. 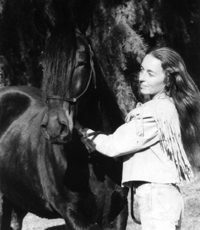 His qualities have challenged me as a horsewoman, and I trained him using all that I could learn of John Lyons' philosophy and techniques. It has been a remarkable experience. Despejo is a special friend to me. I feel the quality of his life, and the time and care I have invested in him is the culmination of all that I have learned throughout my life from so many horses. I remember making a wish a long time ago for this "darkhorse"... and my wish came true.